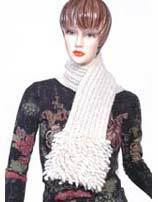 Sorry, we are currently sold out of 'Wool Scarves From Nepal'. These 100% Wool Scarves are handmade in Nepal, and they show all the quality and craftsmanship that has made Nepal famous for their woven goods (think "Pashmina" and you will know what I mean). They are available in Taupe (the light tan color pictured above), Green (pictured on the left), and in White (pictured lower left). When you live with Mount Everest as your back yard, you know a thing or two about making warm clothing! These scarves are very opulant, being 90 Inches Long by 6 Inches Wide, so you get a lot of scarf for not too much money. They are long enough so that you can wrap them around your neck a few times on those really cold nights, and wide enough that you can fold them in half for a more slender look.